I was in the right place. To the left, a busy chef prepared fresh noodles, and if I had been by myself, I would have sat at the bar and watched. This time, however, I had company. When I asked for a table for my friends and myself, we were escorted down a corridor with large goldfish tanks on either side. The goldfish added a bit of color to the mostly white restaurant. Even though the restaurant ‘s chairs, tables, booths, ceilings and floors are white, the place doesn’t seem sterile at all. On the contrary, it is a comfortable and inviting place, and perhaps is a blank canvas for the delicious food like shrimp dumplings and, of course, noodles. If you haven’t had a chance to try Beijing Noodle No. 9, consider dinner tomorrow night. For 9/9/09, the restaurant will be giving guests a special treat. Enjoy tastes of menu items like pickled cabbage, shrimp and pork dumplings, handmade noodles with juicy sliced pork and mushrooms and Kung Pao chicken, for $19.99. The tasting menu will give you a chance to try lots of different dishes so when you go back, you’ll know what to order. In case you need a little extra persuading, Beijing Noodle No. 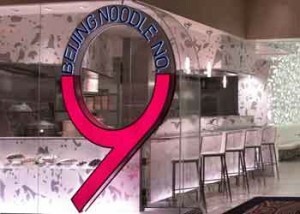 9 was also named one of “Bon Appetit’s”Top 10 new Asian Bars.